Wii Sports Resort(WSR) released last July as a retail title for the Wii with a MSRP of 49.99. Since May of this year, Wii Sports Resort has been bundled with Wii Sports, and included with new Wii consoles for $199.99. Summer started this year on June 21, and summer ended just this past week, on September 22(or September 23?). The last time we looked at the play-time data for Wii Sports Resort was on July 2, but the data breakdown here will be from June 21 through September 20. Wii Sports Resort has 647,890 players reporting play-time data, as of September 20. Since June 21, or over 92 days of the summer, Wii Sports Resort saw an increase of about 153,762 players reporting play-time data on the Wii's Nintendo Channel. 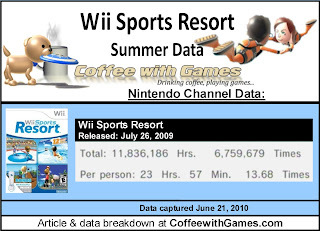 Wii Sports Resort now has 17,039,171 Total Hours reported, compared to the 11,836,186 Total Hours that were reported on June 21. 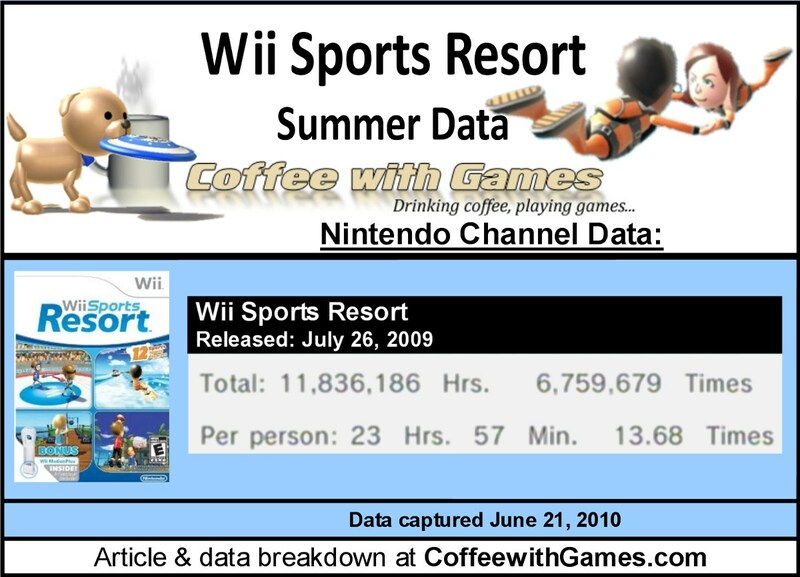 In June, each Wii Sports Resort play session was lasting about 1 Hour 45 Minutes. As of September 20, the average play session for Wii Sports Resort was about 1 Hour 42 Minutes. Wii Sports Resort's Amazon.com sale rank was #70, for the software by itself, not counting what the Wii bundles are ranked. The game is selling for $48.93. Wii Sports Resort's review score average on GameRankings.com has not changed since I posted the data back on July 2. WSR still has a review score average of 83.00%. based on 51 reviews. According to 505 Amazon.com customer reviews, Wii Sports Resort has a 4.5 out of 5 Star rating. So, according the Nintendo Channel play-time data, Wii owners in America spent 5,202,985 hours on Wuhu Island from June 21 through September 20; probably making it the most popular beach resort for 2010. According to NPD data, in July and August this year, the Wii sold 498,200 units. We don't have the specific numbers of the last 9 days of June, or the first 20 days of September so far; but I would think it is safe to assume the Wii sold at least 600,000 units during the days presented by the data. If 600,000 is close to how many Wiis were sold, that means 600,000 copies of Wii Sports Resort were included with those bundles, plus however many units WSR sold at retail by itself. Based off the sales and increased number of players over the summer, that means about 20-25% of new Wii Sports Resort owners started using the Nintendo Channel and approved to have their play-time data reported. Did any of you spend some hours on Wuhu Island this summer? If so, what were your favorite Wii Sports Resort activities? I still don't own Wii Sports Resort, and the last time I visited Wuhu Island was back in December. Yeah, I just picked up Resort this summer. I was waiting on some more Motion Plus titles, but Best Buy had a buy one get one half off sale so I jumped on this and the Red Steel bundle so I could get two Motion Pluses for whatever comes out. Currently hoping the Move and Kinect encourage more Motion Plus use out of developers. My favorite activities are Swordplay, Golf, Frisbee, Power Cruising, Air Sports, Table Tennis, and Archery. Air Sports is probably my favorite because of the exploration aspect of the Island Flyover. I was trying to search back through the GoNintendo podcasts for talk about Resort, and I was really surprised to hear RMC and....oh I've forgotten...one of the other men in the crew say that Power Cruising was their least favorite. I didn't like either of the Wave Race games, and was surprised at how fun this sport ended up being, plus the fact that you can explore the island in practice mode is just so much fun. I know you didn't ask, but it's a question that comes hand in hand with "what's your favorite"; My least favorite sport is.....well I don't really have one. I mean, I don't play Bowling or Basketball as often, but I definitely like them. "Currently hoping the Move and Kinect encourage more Motion Plus use out of developers." I think Microsoft and Sony will pay developers to develop/port games for the Move and Kinect, but I don't really think that will benefit Nintendo much, or WM+. I have only played Wii Sports Resort once, over the holidays. I wouldn't mind picking it up...but I really do want to try Red Steel 2 just to see how WM+ is with it. Being that Air Sports is your favorite, I seem to remember seeing a video of a guy holding the Wii Remote like a paper airplane for that event...if that's how you hold it, does your hand get tired after a while? It just seems like an odd position to continuously hold the controller. Naw. I don't think there's anything in Wii Sports Resort that encourages you to hold it like a paper-plane. You just hold it like normal and guide it around using tilting, and there's lots of stuff to do and see that all play into earning the stamps for that sport. Would there happen to be an edit button for people with profiles? I haven't gotten one because I just like seeing the words the verification process comes up with. Anyway, my thought about Move and Kinect helping Motion+ was that, if Move and Kinect become successful then at the very least Nintendo will push it more (well assuming they aren't preparing the successor to Wii for release next year or something), and it would be sensible to see developers making multi-platform motion centric titles. But you're right, Microsoft and Sony have a history of paying for some of the support they get.